Background: Cassava tuber contains antinutritional compounds and native starch of cassava is not suitable for many food and industrial applications. Modifications by physical, chemical, biological and conventional breeding methods have shortcomings and difficulties. Bioengineering by gene technology is a viable approach to improve starch qualities and remove antinutritional compounds. Objectives: This paper examined the achievements of applications of gene technology to understand starch biosynthesis, production of novel starches, cyacogenic glucosides-free and vitamin A-enriched varieties and set future research goals for safe cassava consumption and expansion of cassava starch functional properties. Method: Searches were conducted for peer-reviewed publications on starch biosynthesis in plants, genetic modification for starch and cyacogenic glucosides synthesis. Quality of the publications was established by the standard method. The information obtained from publications was used to construct the starch biosynthesis pathway in plants, evaluate progress made in molecular understanding and modification of the starch gene. Results: Seven key enzymes involved in starch biosynthesis were identified, including glucan water dikinase for starch degradation. 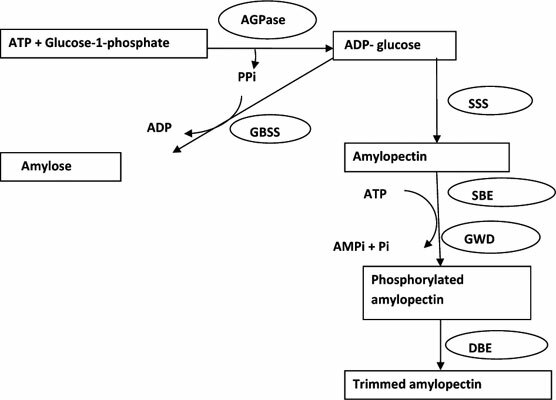 The paper constructed pathway of starch biosynthesis that leads to the generation of amylose and amylopectin polymers in plants. In addition, molecular cloning, phylogenetic relationships, expression pattern, copies number and sequences of four key genes involved in starch biosynthesis in cassava were examined. Furthermore, achievements in genetic manipulation of amylose gene and cyacogenic glucosides in cassava using antisense and RNA interference approaches were summarised. Conclusion: The paper suggested production of cyacogenic glucoside-free, vitamin A-enriched cassava varieties and deployment of gene-editing method for obtaining novel starches from cassava. Amylopectin, amylose Manihot esculenta, genetic manipulation, starch biosynthesis, starch, bioengineering.